Many, myself included, are alarmed at the President’s use of executive orders. Note: It’s not so much that he’s issuing executive orders – administering the laws is the Chief Executive’s job, and executive orders are a legitimate means of executing the laws – or the quantity of them being issued, too few orders could be worse than too many. What’s troubling is his stated purpose for issuing them, not for the purpose of carrying out the laws – but to alter, ignore or even to act without the benefit of their even being a law to act upon. Many others are positively giddy over the promise of his doing so, sure that his orders will get things done and bring about progress. Which is right? More importantly, how is a person to decide which is right? President Obama says that most Americans want the government to be taking action to create jobs, and he promises a “year of actions” to deliver on that promise, assuring us that with his doing so, “we can make progress together“. Many agree, many disagree – but why? Is it just a disagreement over policies? Is whether or not jobs are created, the measure of whether or not Progress is being made? The economy is certainly a concern for us all, especially as he’s taken his failed economic policies beyond ‘a four year proposiiton’ to six years and counting, but is an economic basis, basis enough for taking such sweeping actions as he is proposing? Is “a year of action” by government something that can be called Progress? Is it just a matter of your point of view? What does the President mean by Progress? Does he mean what you think he means? Just for the moment, consider what happens if what he means by progress, is not what you mean by progress (maybe keeping the NSA in mind will help), and if that’s the case, is such a ‘year of action’ likely to result in progress being made? Obviously the issue here is how is “Progress” to be judged, and by who? You? Me? Congress? The President? Wall Street? Without some common standard to measure Progress by, the term becomes worse than meaningless, it becomes an empty verbal decoration that pleases all who see it, while what is actually meant by the word is known only to the person using it. And in the hands of those who hold political power over our lives, property and rights – that becomes a very dangerous decoration. What should you do when words are being used as decorations to help obscure what is actually meant by them? Well at the very least, it seems to me, we shouldn’t comply with such, at best, ambiguous, at worst deceptive, uses of our words. For instance, Liberal is a term I rarely use when referring to the Left, as, in my judgment, they no longer understand or practice what it actually means. But while not misusing a word might hold the line, it won’t advance our position. And with that in mind, I sometimes try turning those misused words against those who would, intentionally or not, abuse them. ‘ProRegressive‘ is an example of my attempting to turn a misused word around towards highlighting its neglected meaning. “Progressive” has been the preferred term of many for over a century, from Teddy Roosevelt & Woodrow Wilson to John McCain & Hilary Clinton, and given how, IMHO, their use of the word is a misuse of the term, I choose to not grant them its cover. Instead, whenever possible, I substitute my pet term, ProRegressive, for the persons and policies of the Left and Right who promote ideas and policies that I see as being in fundamental opposition to Liberty. Why? Because when you abandon Progress, for Regress, you become Pro-Regressive, no matter how kind hearted and ‘good’ your intentions might be, so why on earth should I, or anyone else, refer to them or their policies, with a term whose meaning they fundamentally oppose? But while my term is meant to tweak them, even to mock the positions of those it describes, I don’t use it as an insult (such as leftists using ‘teabagger’ do), but as a means of combating what I see as an ideological misrepresentation of the aims of those who characterize themselves, or their policies, as ‘Progressive’. It doesn’t always go over well when I do. “Oh it’s not an insult, simply a refusal to go along with a gross ideological misrepresentation. The first real progress in history came from the successful threads of Western Cultures development, culminating in the Liberal views of the early enlightenment, across philosophy, religion, arts, science, manners, economics and law (particularly in revolutionary America), and possessed the society and educational views to sustain it. The modern left has consciously, from at least the time of Rousseau, been intent on denying everything from man’s ability to know reality, identify what is true, and make those choices which a life worth living requires, in part, by repudiating Rights as ‘nonsense on stilts’, Free Will as illusion and espousing govts proper role as ‘forcing men to be free’… efforts which have been progressively (the only sense in which that word is appropriate) dismantling the society which first made that state of liberty possible. 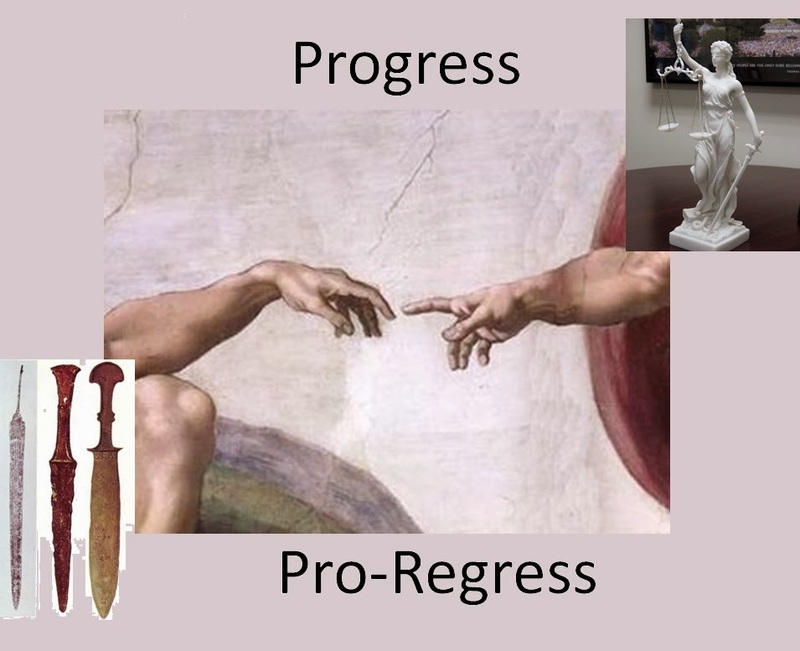 To call any ideas of the modern left, whether in philosophy, religion, arts, science, manners, economics,law or education as ‘progressive’ is thoroughly mistaken (at best), they are Not progress, but Regress. Uh-huh. This from a fellow who blithely posts cartoons and captioned pictures depicting any and all on the Right as being illiterate and dim-witted bumpkins. Ok, fine. But if you notice, I didn’t simply reply by asserting my rightness and his wrongness, instead I gave a quick thumbnail sketch supporting why it is that I think my term is a more appropriate description of his positions, than either ‘Liberal’ or ‘Progressive’ are. Why? Because it’s not enough to just state your opinion, especially when it goes against the stream, we have a responsibility to provide some framework for understanding the point that’s being made. What Karl didn’t do though, is even attempt to refute my explanation. He only asserted that I was wrong and then added an actual insult to it, and then, after a bit of condescension, he actually replied with his summary of someone else’s history of neo-conservatism. What is that? I don’t mean his passive aggressive hostility – it’s a political issue, I get that, no biggie – but why go through the pretense of an argument… if you aren’t going to bother making one? What is that? It’s the result of this: When words are used as pretences, rather than for their meaning, then the sort of evasion and strawman rhetoric that Karl used, provides a typical example of the thinking which ProRegressive thought imposes upon the words and actions of those who practice it: They cannot avoid being evasive, convoluted, and deeply misleading, because of what they believe, or rather, because of what they don’t believe. If you wish to identify yourself as a Liberal (a term which has a specific meaning), while promoting ideas and policies which, in principle, forcibly restrict the liberty of the individual, then you have to resort to misusing and redefining words, and then you will have to back those assertions with necessarily convoluted explanations, and finally, you will have to resort to using power – whether verbally, with unsupported and fallacious assertions, or physically, with individual or government force – to pull it off. Is that an overstatement? Or even an insult? No, it is simply a statement of what I see as being fact. Sometimes though, simply stating a fact, is not enough, and sometimes summaries won’t carry the point far enough across either, and so a deeper explanation is necessary. And with this subject in particular, I think it is important to give not just an explanation, but a lengthy and verifiable one, for why I think that the point I’ve been making is true and important to be grasped. And as a fuller explanation is warranted, and as it will serve as reference for future posts, it’ll save me time later, to make the case now. NOTE: Progress does not mean Perfection, neither does it mean something we should return to, but something we should strive for. Anyone thinking that going back to some idealized point in the past could in any way be progress, is a very confused person, and not just about the meaning of words. Likewise, those thinking that they can make progress, by discarding the lessons learned in the past, is just as deranged as the person seeking progress in the past. Additional Note: Seeking after original understanding does not mean or require discarding new knowledge for old. I highly revere Aristotle, but anyone who has read his Politics, particularly the portion pertaining to Education, and takes that as being Progress for us on this end of time, might not have paid enough attention to what it was they were reading. Progress requires consideration, re-examination and re-consideration, and often it requires discarding that which does not comport with what can be understood to be true, in the current context. Holding something to be true, that is not, can only hold you back. There is no way to make progress, through Regress. So, first things first, we need to define our terms. * ‘liberalism, philosophy or movement that has as its aim the development of individual freedom’ – or restated, a philosophy which believes that that society is best whose members are at liberty to live their own lives, respecting others right to do the same, and participating in the govt which keeps that possible. the faculty of volition, ‘Free Will’, is central to the nature of man, without which morality would be meaningless, and Reason a charade. men are capable of Reason and are responsible for their actions. the best way to live responsibly, is to develop prudent habits and to not allow valuable long term goals to be jeopardized by impulsive actions of the moment. the Arts (legitimate Art, as opposed to stylized political propaganda) have a very real importance and benefit in man’s life, not only showing and inspiring us towards what is good, beautiful and true, but strengthening the appreciation and inclination towards virtuous thoughts and actions through contemplation of the arts. a proper system of government will be representative of those living under it, will have clear, fixed principles and defined methods of administration and for administering justice, whose laws will limit the government’s power to intervene in those moment to moment decisions which the lives of its citizens are lived through. Economics is a study of people’s use of scarce resources which have alternative uses, rather than a political tool for controlling how they should act. Govt’s sole interest in economics, aside from setting a static reference for weights & measures, is in how best to stay out of an economy’s (being nothing but the decisions of its citizens) way. And finally that behaving Anachronistically, applying our modern sensibilities to what was uncommon or unknown at the time, doesn’t increase knowledge or wisdom, but diminishes it. Pursuing progressively greater realizations of these ideals, constitutes real Progress. Progressively undermining, obstructing or reversing these goals, is not progress, and is regress. Those policies which their supporters refer to as “Progressive”, and which I refer to as ProRegressive, are advancing policies which cannot not require the use of force to restrict or eliminate the principle of freedom of choice, under the guise of being a “liberal” proposition, and I will not comply with their Alinsky-ing of such a vital and noble concept. But this too is only my summation of the direction of Progress, and it does not provide you with the necessary perspective for determining whether it actually is progress, or just my opinion of what I think would be best. To be able to properly understand what Progress really is, we’ve got to understand what it really is not, and the best way to grasp that, is by examining its complete absence, and what the first steps away from it actually looked like. Grasp that, and not only will Regress become much clearer, but real Progress will stand out clearer and dearer as well. Accomplish that, and I think the Pro-Regressive wolves in progressive sheep’s clothing will be much easier to spot. Maybe even for Karl. The true understanding of Progress has to begin with understanding what its absence is, and we’ll begin reviewing the history of that in the next post.